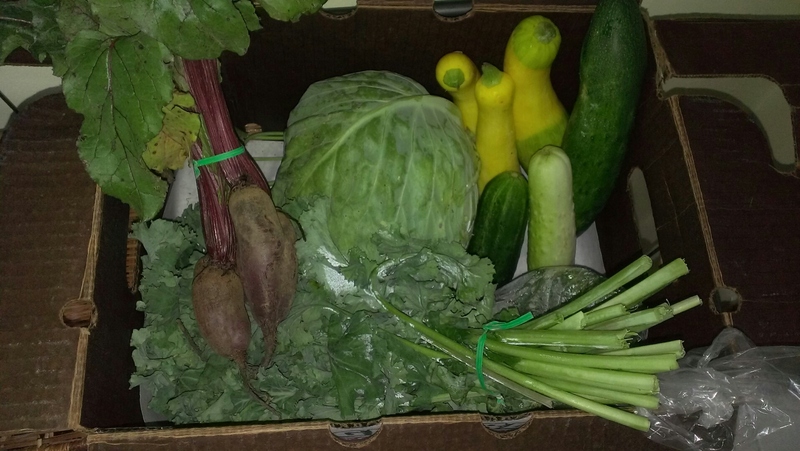 Flying S Farms turned out to be the perfect choice of competitors to feed me this summer; so far I have enjoyed nothing but amazing vegetables! 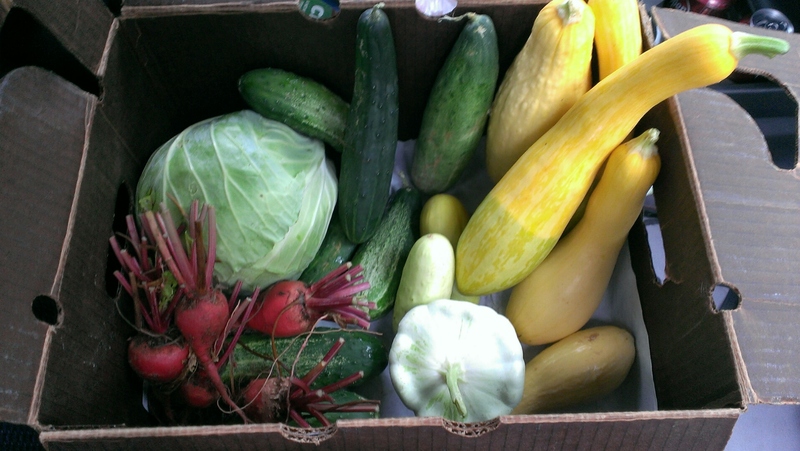 A few foods, such as beets, garlic scapes and flying saucer squash sounded appealing since I had yet to try them. With New Years Resolutions revolving around creating new recipes (among many other goals), I am now up to my ears in new food items and dishes to experiment with. 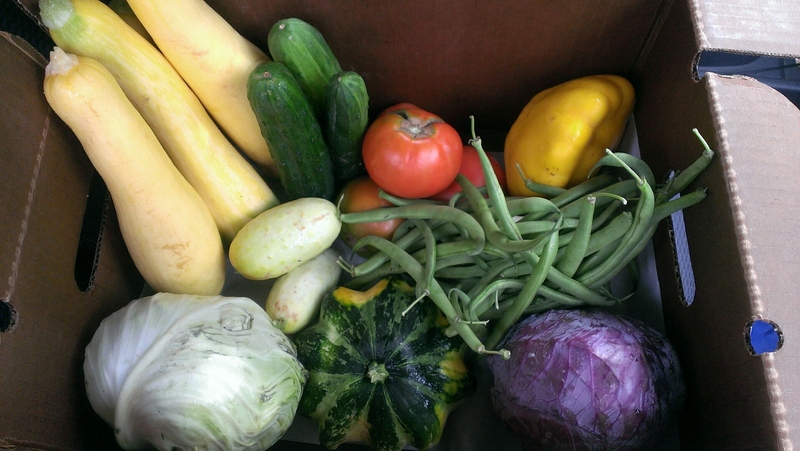 The variety in each basket continues to grow, encouraging me to learn about unique vegetables and new ways to cook items I am already familiar with. Thus, the next few blog posts will probably discuss a few of my newly discovered favorite recipes along with money saving tactics I’ve learned and developed this month. 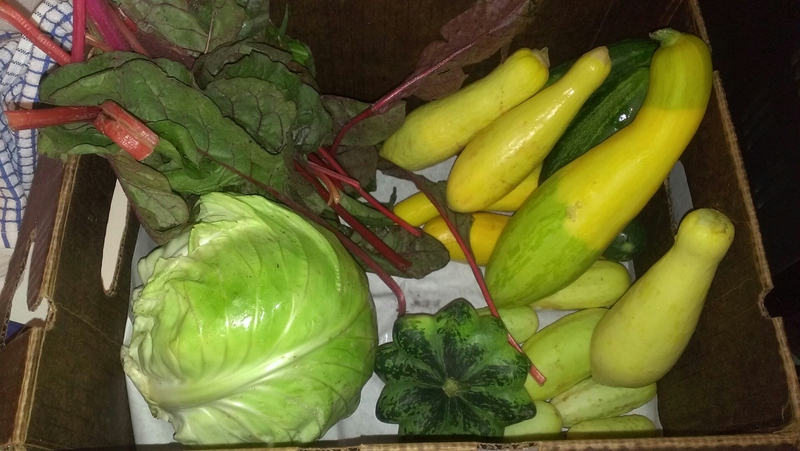 Second week: Cabbage, beets, garlic scapes, chives, lettuce, squash and cucumbers. We love to receive the weekly baskets since the food is already paid for, which helps save money on groceries during the summer season. Ultimately, purchasing local produce ties in well with my July resolutions to save more and spend out what I already have. 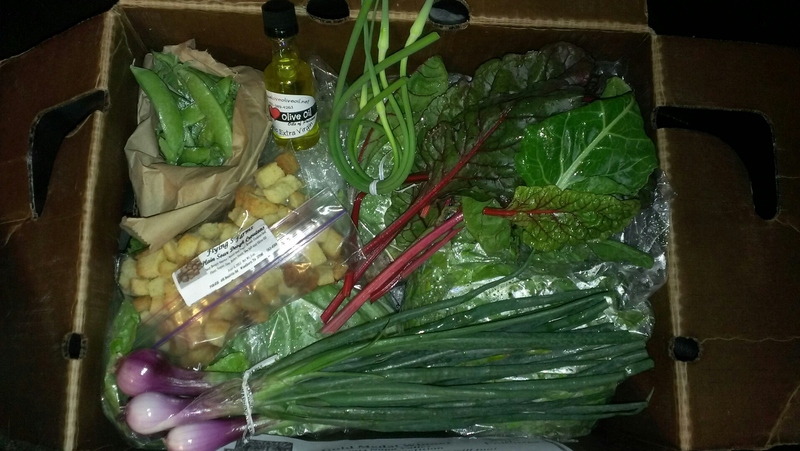 If anyone else is participating in a CSA, what’s in your basket? These look awesome! I’m planning to look into CSA’s once I’m finally settled down for good somewhere. :]! You will be glad you did!! my best friend and i talked about this a few years back, finally got around to signing up earlier this year, and it’s been great. My basket looks pretty much like yours, except we’ve started getting blackberries and peaches as well. I love your idea of stuffing the “flying saucer” squash with quinoa – I’ve had no idea what to do with it! Hi! I nominated you for the Liebster Award. Please get the badge at http://twogypsyheartsincolorado.wordpress.com/2013/07/23/liebster-award/ and get more info. Enjoy and have a great day. This sounds really cool. How I wish there’s a CSA in my place, too, although I can’t really complain … veggies here are usually plentiful, especially the leafy green kind. 🙂 Thanks for stopping by my blog, Cathy. Have been enjoying yours. Those CSAs are great – I love panttypan squash too (flyer saucer squash) – I make it on the BBQ so delish. Sounds like a good idea, our old managers purchased a grill for us as a housewarming gift yesterday, so now that we have a grill, I will have to try this!! I call the squash flying saucer lol……but if you core them out and fill with quinoa and tomatoes, taste so flavorful and juicy. Heck yea, thanks for stopping by! I am officially following you now 🙂 Hope the rest of your weekend fares well! Those CSA baskets are gorgeous! Thanks for the pics and inspiration to find one my area! Thanks also for coming by to visit my blog. Glad to see yours also. Not a problem, I appreciate you stopping by 🙂 we are having a grill out tonight, excited to use some veggies with these burgers later today! 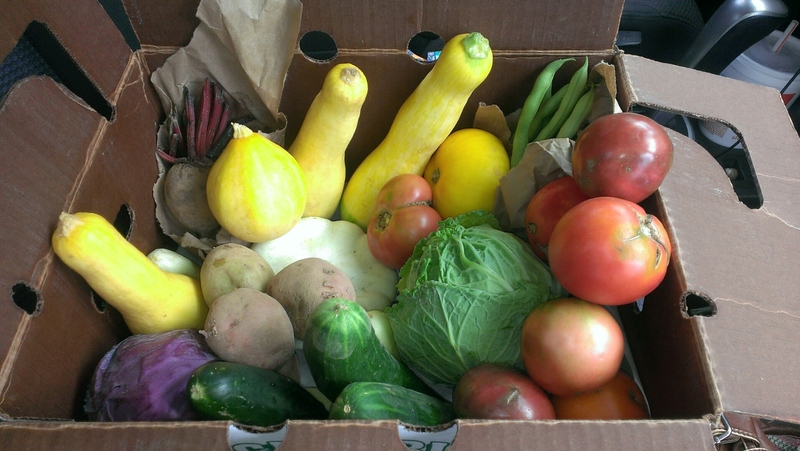 I will pick up my CSA box this afternoon, I am hoping for tomatoes but I think that will be another week or two. Good luck with your produce! Awesome, fingers crossed that your tomatoes came through 🙂 I live in Nashville, which part of the country are you from? I know what you receive in your box has everything to do with the weather and location……….. I agree, it totally depends on location and weather. We are just outside of Philadelphia so we are a few weeks behind you. I have one tomato plant in a container on my deck and it looks like I should have tomatoes this week, whoo hoo!